I had collected three years of experience in this field when I decided to start my own company. I’d worked for plenty of other companies that make quite a bit of profit and accrue bad reputations by taking advantage of people using high-pressure sales tactics. One of these companies in particular, and the last one I worked for, made a particularly bad impression on me. Their profits were made at the expense of their highly dissatisfied clients. I began to research and test other methods and made a small investment with the help of my sweet mom. I started by calling dissatisfied clients I knew from the past to ask if I could come clean their worst areas for free and achieved the results we thought were impossible. Word of mouth spread quickly and I began to see the power of a satisfied client. I changed everything about the industry to suit my clients’ needs. I created a fair pricing system much different from the bait & switch schemes other companies use and started working mainly off of referrals. While working our of my car, I spent my down time knocking on doors and doing free demonstrations in the Memphis area. When I wasn’t out working or spending time with family, I spent all my extra time getting certified in new services, testing equipment, and cleaning products. I asked for my team’s opinions and started learning from their experience so that I could develop ways to improve. Now, 90 percent of our business consists of repeats and referrals. 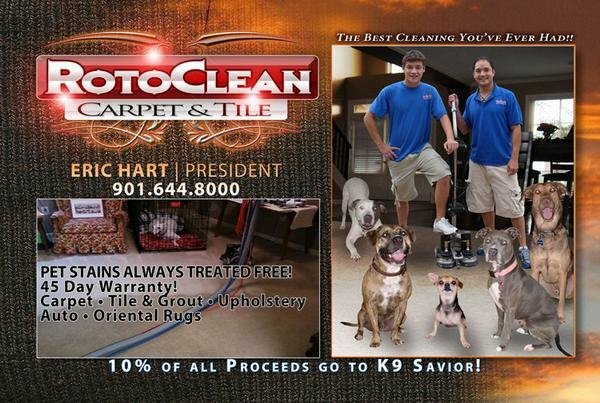 Roto Clean Memphis proudly boasts of our spotless, stellar reputation in the Memphis and North Mississippi areas. Our clients have come to trust that we’re always eager to please. They know that we’re continually researching and testing the latest tools and cleaning agents in the industry. We’re dedicated to getting better all the time and staying far ahead of the competition. We are still a family owned and operated company, and our close friends are our certified technicians. Never roll the dice on whether or not you’ll receive dedicated service with Roto Clean. We now operate three vans, fully-outfitted with extremely powerful, custom-built, truck-mounted equipment and a fourth truck that operates in our stone restoration division. We’ll never forget what’s most important to our success: your happiness. Our stone flooring restoration and polishing services are unparalleled, but our customer service is what sets us apart. We happily provide tile and grout cleaning, carpet cleaning, concrete cleaning, hardwood and laminate floor cleaning as well as pressure washing. We offer more details about our exclusive, completely guaranteed services on our site, but feel free to contact us anytime. Interested in finding out more about what makes our business so unique? Find out the details of our dedication to animal rescuing here.